The terms of a coalition deal, should one be reached, could determine Merkel’s room for maneuver on both the domestic and international stage. 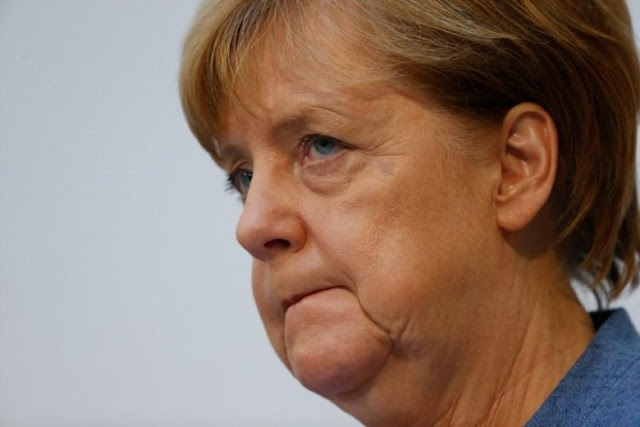 BERLIN - She has earned a reputation as Europe’s chief crisis manager. Now Germany’s Angela Merkel must forge a government out of an awkward group of allies bent on nailing down a coalition deal so tight it risks limiting her room to act if crisis strikes again. The chancellor goes into talks this week about forming a government. But her task, already tough after she lost ground in a Sept. 24 national election, is all the harder after defeat in a regional vote on Sunday further weakened her hand. The upshot is that she must draw on all her consensus-building skills to form a ruling alliance of her conservatives, the pro-business Free Democrats (FDP) and the Greens. During her 12 years in power, she has been able to steer Europe through its euro zone and refugee crises, in part due to her dominance at home. Any constraints on her ability to swiftly shape and enact policies could compromise Germany’s leadership role. If the three party groups fail to reach a deal at all, some in their ranks fear this could lead to public disenchantment and fuel further support for the far-right Alternative for Germany (AfD), which entered parliament for the first time last month. The combination of the groups going into coalition talks is untested at national level and Merkel’s would-be allies are not guaranteeing success. The chancellor’s Christian Democrats (CDU) and their Bavarian allies meet the FDP and Greens separately on Wednesday before they all meet on Friday. “Now we must gauge whether a platform for common policy can be found. For me, that is undecided,” FDP leader Christian Lindner told Deutschlandfunk radio on Tuesday. Adding to the complications, the CDU, FDP, and Greens want to put any deal to their grassroots party members for approval. FDP deputy leader Wolfgang Kubicki has said “it would be illusory to believe we could conclude negotiations by Christmas”. One major area of contention is immigration policy. The CDU and their conservative Bavarian allies, the Christian Social Union (CSU), have agreed a limit of 200,000 a year on the number of migrants Germany would accept on humanitarian grounds. But the other parties reject a cap and instead favor an immigration law with criteria to attract highly educated workers to plug skills shortages. They say the CDU/CSU migrants agreement should not be baked into a coalition deal. Juergen Trittin of the Greens said pressure on the conservative bloc to shift right - after bleeding support to the AfD - could complicate the talks on forming a “Jamaica” coalition, so-called because the parties’ colors correspond with the Jamaican flag. “I fear this will make the Jamaica exploratory talks much more difficult,” Trittin told the Passauer Neue Presse. The three party groups also have deep differences on issues ranging from European Union reform and tax to the environment. A Jamaica coalition was formed in the tiny western German state of Saarland in October 2009, but collapsed in January 2012. The same formation took power in the far northern region of Schleswig-Holstein after elections there in May this year. Annegret Kramp-Karrenbauer, the conservative state premier of Saarland who led the former Jamaica alliance there, stressed the need to establish trust between the three national groups. But the size of the negotiating teams - the CDU/CSU and Greens have 28 and 14 people respectively - is undermining trust before the talks have even begun. Kubicki told Focus magazine it was a “cardinal error” to enter the discussions with such large teams, adding this was “not conducive to building trust and no basis for good and confidential negotiations”. The result of the mutual suspicion is that negotiators are pushing for “deeper agreements” in a coalition deal than in the 130 pages agreed by the outgoing ‘grand coalition’ of Merkel’s conservatives and the center-left Social Democrats (SPD). This risks limiting Merkel’s freedom in policymaking. The euro zone and refugee crises, which were not foreseen in coalition agreements, were addressed with ad hoc decisions. Germany’s budget surplus may help smooth the path in the coalition talks, however. It gives scope to satisfy all sides, to some degree, by paying for both tax cuts and investment in areas such as upgrading infrastructure for the digital age. But if Merkel is unable to form a three-way coalition with the FDP and Greens, she could try to team up again with the SPD - though the SPD has said it wants to go into opposition. Should the SPD reject her approach and Merkel find herself unable to form a government, she could try to form a minority government, or else call fresh elections - an unprecedented scenario. “If we don’t get this under control, the political system we’ve had for 70 years - and the stability it has brought - will be threatened,” said one senior conservative, speaking under condition of anonymity. She has earned a reputation as Europe’s chief crisis manager. Now Germany’s Angela Merkel must forge a government out of an awkward group of allies bent on nailing down a coalition deal so tight it risks limiting her room to act if crisis strikes again.